As controversial new surveillance legislation makes its way through the Senate under the guise of “cybersecurity,” internet activists are taking a new approach to protest. CISA, the Cyber Intelligence Sharing Act, is the latest attempt by lawmakers to push through invasive internet regulation. The bill, which claims to enhance cybersecurity, allows sweeping freedom for corporations to collect private user data. That data can to be shared with specific government agencies, which could then share it with any sector of government. The new law mirrors the USA Freedom Act, which claimed to limit NSA bulk data collection, but in actuality simply shifted collection powers to private companies, which then grant the government access to that data. The website alleges the NSA and members of Congress are capitalizing on a recent security breach in order to push through the legislation, predictably citing national security and public safety. “The truth is that CISA could not have prevented the OPM hack, and no Senator could explain how it could have. Congress and the NSA are using irrational hysteria to try to end privacy on the Internet,” activists argue. Activists have programmed eight separate phone lines to convert emails denouncing the legislation into fax—with each email to be sent to all 100 members of Congress. Ironically, fax machines are popular with members of Congress because of their impenetrability. “One thing that makes faxes – and pagers, for that matter – still good tech is that they are analog and difficult to search. Members love them, especially to transmit data for things like campaign financing records,” one former Congressional staffer told The Guardian. Lawmakers have attempted to push through similar laws before. 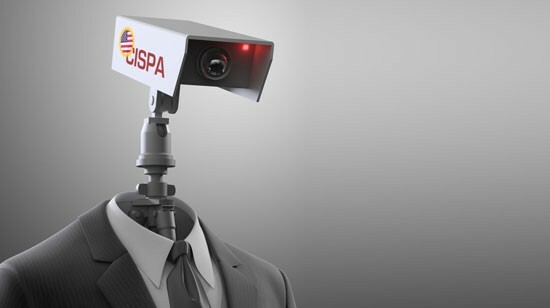 In the past, President Obama threatened to veto CISPA, but has made no such threat for CISA. Senator Dianne Feinstein of California, who introduced the bill, is no stranger to intrusive policy. She has suggested government intervention to determine who is considered a “journalist”—an undeniable blow to independent media. She also voted for the USA Freedom Act. Yet ironically, when her office was reportedly spied on by the CIA, she felt that her privacy was violated. CISA is yet another example of the state’s relentless attempt to monitor, regulate, and control the internet—a domain proving difficult to conquer. Public resistance to internet censorship has made these attempts increasingly difficult. While this opposition is necessary and laudable, it remains that whether or not this new version of CISPA is passed, the state will retain its powers to collect and scrutinize private information. Even so, activists are holding out hope that remain hopeful they can make a difference. “We’ve stopped CISA before, let’s do it again,” reads a statement at cispaisback.org. The Senate is expected to vote on the legislation early next month. Read more about CISA here.